Here we see an interesting study in differences and similarities. On the left is our Sun, seen here in a specific wavelength of light emitted by hydrogen gas. This allows us to see the intricate details on the surface and the prominences extending from the edge of the sun out into space. On the right is Earth’s Moon, our closest celestial companion. In many ways, these two objects couldn’t be more different. The sun is a seething ball of gas, powered by nuclear reactions in a central core with a temperature of over 10 million degrees Kelvin. Its appearance changes day by day and even minute by minute as the gas near the surface is churned by the intense heat within. The moon is comparatively frigid and static. The same side of it always faces us, and its appearance is virtually unchanging except for the phases it displays as it is lit up by the sun from different angles. As different as they are, from our perspective here on Earth, there is one striking similarity. 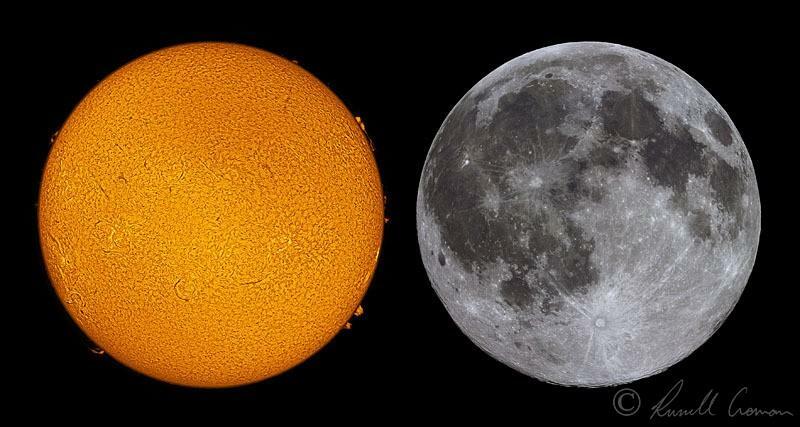 Even though the diameter of the sun is about 400 times that of the moon, and it out-masses the moon by about 27 million times, they are both approximately the same apparent size in our sky, as pictured here. This happy coincidence is what makes it possible for us to observe total solar eclipses. If the conditions are right, the entire disk of the sun is just covered by that of the moon, blocking the bright light of the solar photosphere, but still allowing us to observe the sun’s prominences and corona. The map below shows the current position of the Sun and the Moon. It indicates which parts of the Earth are in daylight and which are in night. The Sun and the Moon both have their influences on the earth. Sometimes they cooperate and sometimes they counteract each other. Such influences are: gravity, the heat of the sun, sunlight and our chronology. The earth rotates with a speed of 65,000 mph(105,000 kph) in an elliptic (oval) orbit around the sun. One rotation around the sun takes 365,42 days. The Western calendar year is 365 days long. Therefore every four years the Western calendar adds an extra day (a leap year) to compensate this. This happens at February 29. In one orbit around the sun the earth ‘travels’ 584,018,150 miles (939,886,400 km). The distance from the earth to the sun is at the closest point 91,402,300 miles (147,097,800 km) on January 3. The distance at the farthest point is 94,509,400 miles (152,098,200 km) on July 4. The moon rotates around the earth in 273,3 days. But because the earth also spins, there are 29,53 days between two Full Moons. It is Full Moon when we see all of its bright side lighted by the sun. When the moon is completely dark, it is New Moon. The classification in months is based on the time it takes for the moon to go through all its four phases. The earth also rotates around its own axis. In 24 hours the earth spins around its axis from west to east. One spin of the earth around its own axis is a day. Different places on the earth’s surface move at different speeds. Places near the Poles barely move at all, while those on the equator (a line midway between the Poles) zoom around at more than 1,000 mph(1,600 kph). Because the earth rotates in 24 hours from west to east, you see the sun rising everyday in the east and sinking in the west. The earth’s axis is not quite at right angles to the sun, but tilts over at an angle of 23,5º , this is the angle of inclination. Through the tilt of the earth’s axis, daylight varies throughout the year. It varies the least at the equator and the most at the Poles. Therefore, it is never completely dark at the Poles in summer nor is it is ever completely light in winter. The cycle of New Moon to Full Moon and back causes that at night a part of the sunlight gets reflected by the moon to the earth’s surface. Because of this it gets less dark. Besides light, the sun also produces heat waves. From the total radiation of heat of the sun, 47 percent reaches the earth’s surface. The other 53 percent gets absorbed or reflected in different ways: 23 percent gets reflected by clouds, 16 percent gets absorbed by steam, dust and gases in the air, 7 percent gets diffused and spread by the atmosphere, 4 percent gets reflected by land and oceans and 3 percent gets absorbed by clouds. Because the earth’s axis is not quite at right angles to the sun, the four seasons exist: spring, summer, autumn and winter. In summer the sun shines longer and is high in the sky and the sunrays shine more directly at the earth’s surface. That’s why the weather is warmer then. In winter it is just the opposite. The sun shines shorter and the sunrays reach the earth’s surface at a wider angle, which causes temperatures to drop. Gravity causes the earth to move around the sun. It is an invisible force that is still not completely understood by science. This phenomenon not only causes the earth to keep moving around the sun, but also to keep the moon rotating around the earth and it makes things fall to the ground. All matter, even the smallest object, has a gravitational force. The heavier the object, the stronger its gravitational force. The sun is far away but it’s very heavy and has a big gravitational force with respect to the earth. Because of the speed, the earth has the tendency to fly away from the sun. The gravity of the sun stops this, so that the earth stays in its orbit. This also happens when you swing around an object on a rope. You feel the power by which you keep the item in its orbit as long as you keep swinging the rope. When you let it go, the item shoots outwards. The earth is also a big and heavy ‘object’ and also has a big gravity. This is why we keep staying on the ground and that everything you let go, falls to the ground. The moon spins around the earth and keeps moving by the attraction of the earth in the same way as the earth keeps moving around the sun. But the moon also has its attraction to the earth. We can see this every day on the beach when we witness the movements of high tide and low tide. Because the sun and the moon exert their gravitational influences on the earth, the earth gets stretched into a slight oval. The solid part of the earth (the crust) is difficult to stretch. With the water in the oceans it gets easier, because it’s fluid. By this the oceans rise and fall at both sides of the earth and you get high tide and low tide. When the sun, the earth and the moon line up, these forces get stronger and you get spring tide (especially high tide). When the sun is at right angles with the moon, then these forces counteract and you have neap tides (especially low tide). Physicists, geologists and meteorologists have long dismissed the idea that the relatively minor fluctuations in solar activity could play a role in a variety of Earthly phenomena. Like so many of the physical sciences, this is because the effects are trying to be explained by mass and gravity. Even more descent is experienced with claims of lunar influences. Again, this is because the Moon’s gravitational pull is too weak for the observed effects. Yet, the studies reveal significant influences. In fact, these studies alone should make us realize that there is a need for a new model of the Earth that could allow for such solar and lunar effects. Here are a few excerpts from the The Vital Vastness revealing the effects of the Field-dynamical Earth Model (FEM). While the actual mechanisms have remained obscure, the topic of solar influences on weather has attained an unprecedented scientific respectability. One understanding which is shared by all scientists is that the solar influence could not be direct. As occurs with most other geophysical phenomena, it is the varying levels of solar plasma and particle flow along Field lines that produces the effects. Because this is unknown, many unanswered questions remain. One is that the superrotation of the upper atmosphere has always been theoretically unexplained. As is typical of the deficiencies involving present-day models, a scientist makes a comment that is still timely: “No physical mechanism for Sun-weather effects is generally accepted at the present time.” Yet, FEM is a model of the Earth that would be expected to create what has been observed. Solar cycle, sunspot and solar flare influences on weather phenomena have been known for a long time. However, such relationships have been denied any real attention by most meteorologists. The reason for this lack of attention is that no satisfactory explanation could be derived from classical physics, particularly with regard to gravity (lunar tidal forces) and mass (fluctuations of solar plasma). Meanwhile, studies disclosing a solar influence on weather are quite extensive. A list of just a few is quite lengthy. Even sunspot structure and climate are correlated. New studies on solar activity and weather can be found in the literature nearly every day. One study disclosed that even the 27.5-day solar rotation was present in weather. This study was criticized on the grounds that it resulted from a problem with filtering the data. However, the real difficulty was remarked upon by the critic, and reflects the actual dilemma, since there is “no physical mechanism to explain a 27.5-day solar rotation in weather.” Such a comment reflects the deficiencies of present theories, and calls for a new model of the Earth. Aside from the 11-year and 22-year cycles, there is also the 45-year Double-Hale solar magnetic cycle reflected in storminess and high tide. The all-planet synod, when all the planets are on one side of the Sun, which can influence solar activity, creates a 178- to 179-year solar cycle that is reflected in Greenland ice cores, and Hudson Bay sediment anomalies. Solar cycles are correlated with sea level, atmospheric pressure, and surface air temperatures in summer, and especially over the oceans in winter. Ozone varies with the long-term solar cycle, as does upper atmospheric airborne particles (stratospheric aerosols), and shifts in climate. The extent of Newfoundland’s ice cover for the period between 1860 and 1988 has been correlated with solar activity. An influx of air from the uppermost (stratospheric) layer of the atmosphere into the layer below (troposphere) has been observed three to four days after solar flares. What is particularly surprising to scientists is that observations indicate a source of ionization from below; a completely unexpected phenomenon (yet predictable with FEM). Weather phenomena, in general, are correlated with the solar cycle. Particle flow ionizes the atmosphere, producing a partial vacuum that alters air pressure. One of the most widespread effects of solar activity is the alteration of atmospheric pressure worldwide. Solar wind particles that enter the polar regions alter pressure, especially above 100 kilometers (62 miles), and the troposphere, varying markedly with the solar cycle. However, the effect is much greater than anticipated, and while the effect is expected for only the circum-polar regions, it is instead global. Solar relationships have been confirmed for many of FEM’s processes, such as the magnetosphere, sea level, the upper atmosphere, and the physical processes of the atmosphere. Atmospheric electricity, temperature, pressure, and circulation are also correlated with solar activity. As could be predicted from an understanding of FEM, every geophysical aspect of weather-related phenomena is affected, even down to the ground and below the oceans (ridges, deep sea currents, etc.). The Interplanetary Magnetic Field (IMF) also has an influence on weather, revealing another aspect of the solar-FEM linkage. Low-pressure systems (troughs), or cyclones in the North Hemisphere, are at a minimum about one day after the IMF sector boundary crossing (SBC) is carried past the Earth. A sector boundary crossing (SBC) is when the IMF shifts from away from the Sun to towards the Sun, or vice versa. The flux of electrons is greater when the IMF is moving away from the Sun (a few hundred eV; an order of magnitude). The SBC is correlated with lightning and thunderstorm frequencies, and the electric field variations conform to FEM, as they were noted simultaneously in the Arctic, Antarctic, and mid-latitude mountain tops. The formation of storms (atmospheric vorticity) takes place along with the SBC. Shortly after solar flares, atmospheric electricity responds with increasing electric fields and lightning frequency. Likewise, electrons increase in the upper atmosphere (stratosphere), during geomagnetic storms. For example, a high correlation exists between the 11-year solar cycle and thunderstorms in England with storm size (VAI) increasing one to four days after solar flares, and other solar eruptions. A particularly strong solar correlation exists for high latitude thunderstorms, but not equatorial thunderstorms. The Fields are located on the northern and southern extremes of the equatorial bulge, and point away from the equator, hence thunderstorms should display this relationship. Ionizing radiation from solar activity can cause large effects on atmospheric conductivity down to at least 15 kilometers (10 miles) at mid-latitudes (the effect is deeper, as will be discussed). Again, the Fields are along mid-latitudes with the exception of the polar Fields. Oceanic thunderstorms maximize in the northern latitudes during winter. Such an effect is due to the fact that the Fields are in the oceans and are more active in winter. Likewise, the North Pacific near the Japanese Current, and the North Atlantic by the Gulf Stream, the Japanese and North Atlantic Fields, are the largest sources of convective clouds that respond to solar activity. Moreover, the Brazilian Field (South Atlantic Geomagnetic Anomaly; SAGA) displays enhanced lightning frequency. Depending on whether it is solar minimum or maximum, global thunderstorm activity increases by 50% to 70% four days after major flares. The solar-FEM linkage and Field locations are conspicuous in these data. The center of mass of the Solar System is known as the barycenter. Shifts in the barycenter occur whenever Jupiter and another of the large planets are aligned on one side of the Sun. These shifts affect solar activity, and in turn, weather is affected. Times of less distance include periods such as the Sporer and Maunder Minimums in solar activity. Just prior to these minimums there were solar maximums that produced climate and radiocarbon (C14) fluctuations that, after a lag time, are noted during these minimums. The Maunder Minimum was a time of the Little Ice Age when glaciers most recently advanced down mountains around the world. The Little Ice Age was a time for low values in long-term temperatures for all seasons, enhanced variability of temperatures from spell to spell, and year to year, and an enlarged polar ice cap and frigid air over the Northern Hemisphere that was accompanied by jet streams that were weaker and further south than those of today. This entire relationship with regard to weather is all the more obvious in studies on the effects of the 11-year solar cycle on climate. Numerous studies have been conducted that indicate the reality of a 11-year solar cycle in climate. For example, the 11-year cycle is conspicuous in worldwide air temperature, air pressure, and ozone. The 11-year solar cycle has been correlated with air temperature, air pressure, droughts, floods, lake levels, snowfall, tree abundance, and tree-ring growth. Rivers, such as the Nile, Ohio River, and Parana River (Buenos Aires, Argentina), rise and fall in accord with solar activity. Numerous examples exist that reveal an 11-year solar cycle influence on weather-related phenomena. Auroras in the upper atmosphere are followed by thunderstorms in the lower atmosphere. However, the energies of the auroras are many times less than the thunderstorms, and any connection cannot be accounted for by present models of the Earth. Even, ball lightning is correlated with solar activity. Lightning and thunderstorms increase after solar flares and IMF sector boundary crossings, as well. Lightning and thunderstorms occur mostly around the 30o to 40o latitudes, and along the longitudes of the Fields. The role of the Fields can also be noted in the numerous examples of luminous phenomena that issue from above the cloud tops into the upper atmosphere, ionosphere and magnetosphere, as well as the other way around. The only model that can explain all of these observations completely is FEM. Studies of the geomagnetic activity have revealed that major geomagnetic fluctuations occur shortly after both equinoxes. During the equinoxes the Earth’s poles are basically perpendicular to the ecliptic plane allowing greater interaction with the IMF. Also during the solstices one pole interacts with the IMF more than usual. Because of this, a number of phenomena are more active at those times, one of which is weather. Reports of visually observed lightning discharges from thunderstorm cloud tops into the clear air above also cluster around the equinoxes and solstices. At times these lightning strokes are greater than the cloud-to-ground strokes. They involve strong electric fields arising from “large local accumulations of charge” (i.e., masses of ionized particles). One of the more recent observations occurred on 22-23 September 1989, around the equinox, and were associated with hurricane Hugo. This discloses how the atmosphere was highly ionized around the time of the development of a devastating hurricane, and the source of the particles came from below. Other incidents that were recorded were noted within less than a month of either the equinox or solstice, with the March equinox represented the most. For example, on 11 April 1965 there was a cloud-top stroke noted, at which point 47 tornadoes touched down in Illinois, Indiana, Iowa, Michigan, Ohio and Wisconsin. The mechanism responsible is, conventionally speaking, unknown. However, it is known that it involves the acceleration of electrons (and other particles) upward in a direct process from below that penetrates the upper atmosphere (ionosphere) and magnetosphere. The observations are totally supportive of what would be expected of FEM. The discussion then continues with a review of a myriad of studies on the solar cycle in weather. Solar wind plasma effects alone cannot explain these correlations. A number of facts indicate that the Moon affects geophysical phenomena far beyond what would be expected from its gravitational pull. According to statistical analysis there is a lunar effect on a variety of geophysical and meteorological activity when the Moon is within 4o of the (ecliptic) plane of the Earth’s orbit around the Sun. For example, between Full Moon and Last Quarter (on the morning side of the Earth), there are geomagnetic storms. The effect is known to be due to energetic particles that are precipitated into the upper atmosphere, producing electrical currents that perturb the magnetic field (i.e., electromagnetic induction). This effect also involves the entire field system of FEM. The geomagnetic field is also affected by eclipses, which increase the conductivity of the atmosphere (E-region). Lunar effects are more dynamic than previously realized because the effects are due to interaction with the Fields and particle flow (electrostatic repulsion, plasma torus, bow shock, etc. ), not gravity. Declination and position of the furthest (apogee) and closest (perigee) approaches of the Moon display a lunar phase influence. As is typical, conventional gravitational models do not explain these effects. For example, the heaviest rainfalls of the month at stations in New Zealand, and the Spanish peninsula were correlated with lunar effects, while the magnitude rules out gravitational forces as the primary influence. Yet, the West Australian Field is near New Zealand, and the Mediterranean Field is near the Spanish peninsula. An electrostatic trigger is responsible for these lunar effects, which involves the Moon causing particle cascades along Field lines (electrostatic repulsion, bow shock, plasma torus, etc.) that ionize the atmosphere. In accord with FEM, the forcing mechanism is a time-varying balance between the Coriolis force and the tractive force of the 18.6-year lunar cycle, which reaches a maximum at the 35o latitudes. Likewise, the phases of the Moon are known to effect widespread, heavy rainfall in the United States. According to the records of 108 stations, thunderstorm occurrence east of the central United States — the half closer to the North Atlantic Field — is related to lunar positions for the years 1930 to 1933, and 1942 to 1965. Full Moon is the most influential, two to three days after which increased thunderstorms take place. Even the degree of cloudiness or sunshine is related to the lunar month (synodic cycle). Daily data for the period 1900 to 1980, in the United States, revealed a lunar influence (phase progression) on variations in precipitation. The Moon’s revolution around the Earth, or lunar month, known as the lunar synodic period (29.531 days), and also half that period (14.765 days) were detectable. Again, the effect is not explainable by gravitational models, especially with regard to geographic region and season. The geographic effects are due to Field location and contours, and the seasonal shifts are the result of the solar-FEM linkage. The impact of these influences can be understood by this statement offered by two climatologists: “It is observed that when the maximum lunar tidal epoch is in phase with the maximum solar activity epoch, climate and economic impacts are amplified.” History shows us that this is the case, and could be predicted with an understanding of the solar-lunar-FEM linkage. The new model of the Earth is even more obvious, because weather-solar connections are “manifested differently in different geographical regions and depends on longitude, as well as latitude. This has been evident in studies of 11-year periodicities in pressure, and also shows up in short-term correlations with solar flares and magnetic activities.” Others have also commented on this relationship. The Fields are in the oceans, and as a result, the solar cycle is noted in sea level, as well as air temperature and pressure over the oceans. Ocean circulation and shelf-area currents are at a maximum off the North and South Coasts in high to mid-latitudes and equatorial latitudes. Meanwhile, in accord with FEM, certain types of ocean circulations are near zero values around the 30o to 40o latitudes, the latitudes of the Fields. Other weather observations disclose the latitude restrictions of the Fields. The Fields are situated on the northern and southern extremes of the equatorial bulge, and point away from the equator. Hence, a high correlation exists between the sunspot cycle and high-latitude thunderstorms, while it is low or negative for equatorial thunderstorms. This is why standard models do not explain much of the evidence. Long-term oscillations of the upper atmosphere (thermosphere) are triggered from below on special occasions in the winter. This winter effect, with the Earth tilted away from the Sun and being triggered from below, is not what could be predicted by present models, which instead predict effects from above in the summer. The consensus is clear: “The evidence shown for an intense coupling between the basic states in the strato-, meso- and thermospheres during late winter is physically not yet explainable. But why are the internal atmospheric processes so well reflected in the upper region during winter?” As stated previously, the Fields are more active in winter, due to the solar linkage of the IMF. The data urge that the inevitable be asked: “How could the feeble variations in solar output over a cycle be amplified to give the apparent changes in the weather, a required amplification of over a million?” Those who uncovered the best statistical representation of the effect discuss the pervasive mind-set: “‘Serious’ meteorologists still prefer to dismiss any claim that there is a noticeable relationship between the activity of the Sun and events on Earth. And yet, to our surprise we have found a highly significant correlation between the state of the atmosphere and solar activity, from the ground to the top of the stratosphere.” The new model is clearly responsible for the effects, especially since the effects reach ground level. In contrast to what would be suspected, a 2% decrease in the blue end of the spectrum and a similar increase in the red end of the spectrum occurs during solar maximums. This spectrum shift should cause a slight warming of the Earth, not the opposite as is observed, indicating the need for some unknown mechanism(s). The data force us to conceive of a new model of the Earth, and FEM is ideal. Conventional theories are seriously lacking when it comes to the energy required for some weather phenomena. For example, El Nino requires a tremendous amount of energy to heat the Pacific waters, air-water interaction and planetary scale waves, and the shifting of the mid-latitude jet streams. Another example is what is called winter weather bombs where a more or less “white hurricane” develops in about a day and dumps huge amounts of snow along the East Coast. There are many other high energy demands in geophysical phenomena that requires an Earth with an energy source. Another Polar Field weather phenomena is the ozone holes that development over each pole. The seasonal effect is evident in the fact that ozone falls considerably in spring, after the equinox, over Antarctica. A solar influence on ozone levels has been known for a long time. The loss is confined to altitudes between 12 and 20 kilometers (7.5 and 12.5 miles), when solar effects should be above 20 kilometers, according to present models. Like other weather phenomena this appears to be due to a source of ionization that comes from below, rather than above. Moreover, nitrogen dioxide, which is destructive to ozone, and believed to be the result of the observed solar influence, is the lowest in the world within the hole. Many scientists find it difficult to accept a solar influence on ozone, but the facts speak for themselves. The conclusion of researchers asks for FEM: “Scientists will have to determine the mechanism causing the ozone destruction. They must also explain the timing of the loss.” Both poles show ozone depletion with the same seasonal and solar effects, and energetic electrons were noted to be partly responsible for producing the holes, as expected of FEM. FEM is clearly involved simply by noting the fact that glacial advance in the Northern Hemisphere, during the last 100 years, shows a lack of synchronicity with that of the Southern Hemisphere. That is, the solar linkage activates one hemisphere in one period, and the other in another period, depending on which hemisphere is pointing away from the Sun, and the polarity of the Interplanetary Magnetic Field (IMF) at the time of peak solar activity. Each glaciation can be matched with acidity levels recorded in polar ice cores, and typical of FEM’s interconnected phenomena, the frequency of volcanic eruptions. The 18.6-year lunar and 11-year solar cycles, as well as long-term solar variations, are also observed in glacial advance and ice ages. The last glacial stage offers a good example of how FEM produces glacial advance and ice ages. Aerosol content of the eastern Antarctic ice indicates that there where large marine and continental inputs at the end of the last glacial stage. Aerosols are airborne droplets of water, and indicate the intensity of wind speeds at the time. Glacial age climate had stronger atmospheric circulation, enhanced aridity, and more aerosol production, as noted in the Antarctic ice. In spite of the greater extent of sea ice, sea salt content in aerosols over central Antarctica was higher, which is due to more aerosol production driven by greater wind speeds over the oceans’ surface. The greater salt content indicates greater storminess. The continents were drier, and active deserts between the 30o latitudes were five times larger than those of today. Stronger ground level winds left behind sand dunes and wind-erosion features (ventifacts, eolian deposits, and loess). About 13,500 to 12,000 years ago, there was an end to the aridity maximum in Africa, the stabilizing of sand dunes in the Australian desert, and a relaxation of the once vigorous circulation. Just prior to this glaciation there was a burst of solar activity so huge that it pitted the rocks on the Moon! This solar burst is the triggering mechanism for the sudden glacial advance. A solar-FEM linkage was clearly an aspect of producing this ice age. The nearly instantaneous onset of glacial advance of the ice age cannot be explained by anything other than FEM (see Figure 6). Mammoths that have been found illustrate just how fast the advance was. Whole mammoths, without a single claw or tooth mark of a predator or scavenger, and food still undigested in their stomachs and stuck between their teeth, were uncovered a number of times. Often they were found still standing frozen in the ice. Had the snow fallen slowly or even quickly by modern standards, they would have undoubtedly finished digesting the meal in their stomachs, licked the last morsels between their teeth, and fallen on their sides to be consumed by some predator or scavenger. Instead, the snow fell so quickly that when one body was uncovered in Siberia, sled dogs ate is without the slightest ill effects, as if it were freshly thawed beef. When reindeer or caribou die in the Arctic, they have been noted to quickly decompose due to remnant body heat and bacteria. This, however, did not happen to the mammoths. Moreover, the undigested vegetable meals in their stomachs should have also quickly decomposed. In fact, the very delicate buttercup found in the stomach of a mammoth should have decomposed within 10 hours. The air temperature would have to be 150o F (62 o C) below zero in order to cool the stomach from 74o to 40o F (14o to -7o C) within ten hours, and thereby, preserve the buttercup. Yet, the initial body temperature was closer to 100o F (30o C), which would require a temperature drop to about 200o F (93o C) below zero. Moreover, on examining mammoth blood it was discovered that red and white blood cells were still whole, and had not burst. Slow freezing, such as is typical even of a blizzard, would have expanded the cells, causing them to burst. The only known method of preventing blood cells from bursting upon freezing is to use the extremely rapid freezes of cryogenic methods. Likewise, fatty tissue under the skin had survived even after the exposed skin began to decay. Again, had the freezing been slow, or had the mammoths died slowly, the fatty tissue would have been gone long ago. There is no way that conventional theory can explain such rapid glacial development, and while this has been reported in the literature with astonishment, it has gone unexplained, and hence, ignored and even denied. Yet, with FEM there can be the sudden ionization of the atmosphere, triggered by a burst of solar activity, which could cause such a rapid glacial advance. In Tome Three the subject of plate tectonics, more commonly known as continental drift, was discussed to some extent. That discussion brought forth the understanding that electrostatic forces are at work in producing the tectonic plates’ dynamics. These electrostatic forces result from particle flow along Field lines with the descending limbs interacting with plate boundaries. Further confirmation of this understanding can be found in studies that correlate solar activity, and lunar phases and cycles with the triggering of earthquakes and volcanic eruptions. One fact that calls for new perspectives on plate tectonics is that earthquakes are correlated with solar activity. Solar activity, as indicated by sunspots, solar flares, radio noise, and solar-induced geomagnetic activity, plays a significant role. A maximum of earthquakes occurs at times of moderately high and fluctuating solar activity, particularly solar flares. Strong earthquakes take place when the Earth crosses the central meridian of the Sun, and this understanding has been used to successfully predict some quakes. Moreover, the Sun’s retrograde motion is linked to earthquakes and other geophysical phenomena, including climate and volcanic activity. These facts alone indicate that the solar-FEM linkage and electrostatic forces are involved in earthquake occurrence. However, there is much more, as for example in observations of California earthquakes. There is a 22-year solar cycle in San Andreas Fault earthquakes, and an 11-year solar cycle in large earthquakes in southern California. Recent observations of earthquakes in the region disclosed that they have doubled between 1986 and 1989. Furthermore, from August 1988 to February 1989, they were 3.2 times more frequent than the historic rate. Quakes of magnitude 4.5 and greater went from one every four years to one every two months. This increased earthquake activity transpired as a peak in solar activity was taking place. Variations in gravity, earthquake energy, and solar activity were correlated in another study. Solar activity and quakes have been linked by many researchers, and they all agree that gravitational models do not work. Also revealing the need for new models is the fact that a maximum in earthquakes in some regions occurs shortly after an epoch of very low sunspot activity. Also demonstrating the global system, plate motions have been observed to follow solar activity at 71 stations around the world. The plates more back and forth as the 11-year solar cycle goes up and down. This is why some regions experience quakes during epochs of low solar activity, while in other regions it is increased solar activity. This indicates that there is a global system, regulated by the Fields, and also involves the solar linkage of FEM and electrostatic forces. Illustrating the effects of this solar linkage are the correlations between earthquake activity and the Sun’s Interplanetary Magnetic Field (IMF). The IMF sector boundary crossings (SBC) cause changes in the Earth’s magnetosphere, ionosphere and atmosphere. Enhanced precipitation of energetic electrons take place as the Earth’s magnetic field is disturbed, which is accompanied by changes in wind direction and the size of storms (Vorticity Area Index; VAI), about four days before and after the SBC, with the greatest effect in winter. The SBC are also correlated with lightning and thunderstorms, which display a maximum in winter, as well. Also, large changes in conductivity and electric field variations are global. The IMF and the geomagnetic field (GMF) interact, producing a twelve-month wave with a maximum at the vernal equinox, and are the “result of a common cause.” These observations reveal the dynamics of FEM’s electrostatic forces, which trigger earthquakes. The Sun’s motion around the barycenter, or the center of mass of the Solar System, which is determined when Jupiter is in conjunction with another of the large planets, has a triggering effect on earthquakes. This and other correlations have led scientists, including the American Geophysical Union, to state that a solar-terrestrial linkage exists. The center of mass also has an influence on solar activity, and is likely to be behind this correlation. The solar linkage is noted in the fact that solar flares abruptly change the Earth’s rotation or length of day (LOD). This altered rotation has been shown to trigger earthquakes. A 120-day oscillation in the LOD, atmospheric zonal circulation, solar activity, the IMF and the GMF are also known. A global system and its solar linkage have been observed in a number of ways. Different earthquake belts have common active periods, indicating that they are strongly coupled on a global scale. Isotopes, such as radon, are noted at times of earthquakes, and indicate an electrostatic trigger, as well. A global network of earthquakes reveals the need for a new model of the Earth that includes electrostatic forces and global field dynamics (see Chapter 29 for other discussions). Many plate tectonics theorists dismiss lunar effects, because tides have little effect on the Earth’s crust. They criticize any correlation between maximum global tidal forces and quake regions where local tides are not at a maximum, or can even be at a minimum. Meanwhile, studies of lunar phase triggers in 21 earthquakes show that fourteen occurred at the Quarter Phase, five at Full Moon, and two followed an eclipse. Interestingly, the majority of Quarter-Phase quakes took place in the Southeast, in the region of Baton Rouge, Louisiana to Columbia, South Carolina, which surrounds the North Atlantic Field’s stem. In contrast, California earthquakes, which are triggered by the dynamics of the descending limb of the Field, show a peak with a three- to four-day delay. Some scientists claim that the lunar effect is gravitational (i.e., tidal). In fact, one study of 2,000 earthquakes demonstrated that they took place at times when tidal forces where over the epicenter of deep-focus earthquakes. A lunar trigger was instrumental in an earthquake that took place in Parama, Italy in November 1985. Lunar and solar “tidal” components were instrumental in triggering seismic activity in the volcanic areas of Hawaii, the Phlegrean Fields, and Vesuvius. Earthquakes occur more often when the Sun and Moon are in opposition (opposite sides of the Earth) or in conjunction (aligned on one side of the Earth). Both of these configurations have greater gravitational effects, but they are insufficient in themselves to trigger an earthquake gravitationally. Other correlations exist between lunar phase and earthquakes, which only appear to be gravitational. Undoubtedly, the gravitational effects are too weak, but the correlations show that there is a lunar trigger. The mechanism is revealed when it is understood that there is a lunar trigger on the occurrence of aurora. In fact, sunspot cycles were investigated by using the aurora and earthquake records of ancient China. Similarly, statistical analysis indicates that there is a lunar effect on geomagnetic activity. When the Moon is within 4o of the ecliptic plane, between Full Moon and Last Quarter (on the morning side of the Earth) there are geomagnetic storms. The Moon triggers particle flow that, through electromagnetic induction of charged particles, disturbs the magnetic field. The influence is electrostatic with the Moon triggering cascades of particle flow, and changing the contour of the electromagnetic characteristics of the Fields (i.e., bow shock, plasma torus, potential gradients, electrostatic repulsion, etc.). These geophysicists insightfully question the ability of the present Earth model to explain the results. One physicist disclosed that all major earthquakes can be forecasted simply by observing the lunar surface. Seismic events on both the Earth and Moon are so precisely timed that it is “as if the Moon were in direct contact with the Earth; as if it were its seventh continent.” Data from 639 major earthquakes were compared with 370 events listed in NASA’s catalog of transient lunar phenomena (TLP) for the period between 1904 and 1967. TLP are luminous (high-energy charged particles) or dark (neutrons) phenomena, which are likely to be the Moon’s influence on particle flow. These data made it evident that events on the Earth and the Moon are mutually registered with a time lag of up to three days. An eight-fold increase in earthquakes has been observed during the First and Last Quarter at closest approach (perigee), with the ascending node pointing toward the Sun around vernal (March) equinox, or the descending node near the September equinox. As occurs with weather, the 18.6-year lunar nodal cycle is also involved. One such example was the 2 March 1933 earthquake in Japan, which was one of the most powerful on record (8.9 on the Richter Scale). The seasonal effects can also be noted in TLP for the years of 1178 to 1982. The greatest occurrence of TLP took place around the December solstice and the March equinox, with the September equinox and June solstice represented less often. The seasonal peaks are fall and winter, as were noted for both earthquakes and weather. The evidence indicates that there is an electrostatic trigger on earthquakes. The solar wind provides particles in the form of solar plasma, the Earth’s magnetosphere becomes enhanced, and the Moon triggers particle cascades along Field lines, which then interact with plate boundaries. The equinoxes are times of greater interaction between the GMF and IMF, and are also times of increased earthquake activity. Lunar phases and mid-phases (a mechanism with a 3-4 day delay) are times of greater probability for triggering particle cascades. Figure 7 shows the influence of these factors in histograms compiled from the analysis of 562 earthquakes. Table 2 displays examples of the ten worst earthquakes in history, and these factors in relation to their occurrence. [Note: this figure and table are not included on this web page, but may be at a later date]. Similar triggers that occur with earthquakes have been observed for volcanic eruptions. The global Field system is apparent in the fact that volcanoes are completely related to plate tectonics. About 80% of the world’s active volcanoes are near subduction zones, another 16% are on mid-ocean ridges, and the remaining 4% are at plate-plate boundaries or hotspots in mid-plate. As already reviewed, plate motions follow solar activity, and common sense dictates volcanics do also, because volcanics are strongly related to plate dynamics. A solar linkage is also apparent in volcanic eruptions, such that solar motion and changes in the length of day are correlated with volcanic activity. Lunar influences on volcanic eruptions are unmistakable. The triggering of some events took place at Full Moon and New Moon. In addition, the cycle between the closest and furthest approach to the Earth (apogee-perigee cycle) is observed in the timing of eruptions. Likewise, micro-earthquake frequencies near an Alaskan volcano were correlated with the oceanic tides, which result from lunar effects. Gravitational changes take place prior to volcanic eruptions, such as those observed at Poas Volcano, Costa Rica. Like earthquakes, this effect cannot be due to gravitational forces alone, because they are far too weak. Peaks around the equinoxes and solstices reveal the solar linkage. One study disclosed a maximum of volcanic activity for Mount Vesuvius and other volcanoes during the solstices and equinoxes. Other research indicated that lava surfaces in the Halemaumau Crater at Kilauea Volcano stood higher around the solstices than around the equinoxes. Eruptions at Kilauea and Mauna Loa clustered around the December solstice. Fayal, in the Azores, was noted to erupt around the equinoxes. Likewise, a study of 65 flank eruptions at Mount Etna, Italy from 1323 to 1980 disclosed that there were higher than average eruption rates in November just prior to the December solstice, and in March and May around the vernal equinox. Another study of 4,200 eruptions showed a maximum in June, around the time of the solstice. As noted for earthquakes and weather phenomena, seasonal, equinoctial and solstitial peaks in volcanic eruptions are beyond present models of the Earth, and reveal a solar linkage. These factors are even more supportive of FEM in another study. Volcanic eruptions are more frequent for latitudes north of 30o North Latitude and south of 30o South Latitude, during April or May following the vernal equinox. For the equatorial region it is a June maximum around the solstice. When all latitudes are considered together the peak occurs in March and April, around the vernal equinox. For the period 1500 to 1700 peaks were in winter (January through March) and fall (October to December), but this correlation was not significant. Volcanic eruption frequency occurs most often in the northern mid-latitudes (30o to 60o North), and less so in the low or equatorial southern latitudes (20o North to 10o South), and each hemisphere has its own history. FEM and its solar linkage is evident in the absence of synchronicity between the hemispheres. The solar linkage activates one hemisphere in one period and the other in another period, and this activation depends on which hemisphere was pointing away from the Sun and the polarity of the IMF at the time of peak solar activity; as occurs with glacial advance. Evidence indicates that there is an interaction between gravitational and electromagnetic fields in accord with general relativity. Non-gravitational forces are evident in the Earth-Moon system. Furthermore, gravity has been observed to shift during solar eclipses, such as in June 1954. The conclusion of the physicist who performed the original experiment has been relatively ignored. Such observations, he concludes, can be accounted for “only by the existence of a new field.” Once again the Field-dynamical Earth Model (FEM) is called for. Another phenomenon that reveals the workings of FEM, and its solar and lunar linkages, is changes in the Earth’s rotation, affecting the length of day. Again, the forces involved have a non-gravitational character. Also the changes occur along with other geophysical phenomena. The length of day (LOD), the period required for the Earth to complete it rotation, has varied throughout time. Like so many other geophysical phenomena, solar activity has been correlated with changes in the length of day. Different LOD occurred along with fluctuations in solar activity in the periods 1780 to 1960, and 1900 to 1979. Solar flares are known to abruptly alter the Earth’s rotation. For example, the great flares of 1959 and 1972 brought abrupt changes in the LOD. Both long-term and short-term changes in solar activity alter the Earth’s rotation. The 11-year, 22-year and 56-year solar cycles are conspicuous in the LOD data. Long-term (secular) changes were noted at times of fluctuations in solar activity in the past, and the evidence indicates that these changes were very likely abrupt. Observations of the LOD, like so many other geophysical phenomena, reveal the solar-FEM linkage. Like other Earthly phenomena, the Moon also exerts an influence on the length of day. The 18.6-year lunar nodal cycle is apparent in LOD changes. During the last 2,500 years the deceleration rate of the rotation and the uniform recession of the Moon appear to be necessary to explain the variations. However, this would require a change in gravity, or in the mass of the Earth and/or the Moon, if it were to be described in conventional, gravitational terms. Other evidence demonstrates that neither gravity nor the mass of the Earth or Moon have changed substantially within that same time frame. This conclusion is surprising within the framework of conventional thought, to say the least. Notwithstanding, such an observation is in accord with the FEM-lunar linkage, which goes beyond gravitational factors. Furthermore, the greatest lunar tidal effect is between the 40o latitudes, which are the latitudes of the Fields of FEM. This makes the Moon ideally located with respect to interacting with Field dynamics and the triggering of particle flow. The “surprising” aspect of such an interpretation, that gravity or mass have changed, is bound up in the perspective that everything is explainable by gravity. Basing conclusions on a gravitational perspective (lunar tidal torque) forces such an enigmatic deduction. However, the real effect is non-gravitational, and involves the Moon’s interaction with particle flow along the Field lines of FEM (an effect that originated in the polarization of the vacuum during the protoplanetary stage). Confirmation of the effect’s non-gravitational nature is evident in numerous observations. One is that a correlation exists between the LOD, weather and solar activity. Alterations in the Earth’s rotation, variations in the upper atmosphere’s density, and geomagnetic storms fluctuate with solar activity. Variations in the upper atmosphere’s density and geomagnetic storms would be expected from the ionization produced by particle flow. A few scientists have claimed that the changes in rotation are due to weather phenomena acting on the Earth’s surface (i.e., wind shear). Meanwhile, the rotation slowed just prior to one of the greatest weather disturbances in some forty years, the strongest El Nino on record. A strong peak in the increase of LOD preceded an unusually intense El Nino in 1982-83, not the other way around. A similar rotational change also preceded the El Nino of 1997-98. Likewise, a correlation between weather and solar activity still stands up against all tests, though it remains unexplained by conventional physics. Furthermore, weather, solar activity, earthquakes, volcanic eruptions, and other geophysical phenomena are correlated with changes in the LOD. A solar-FEM linkage exists that is coupled with FEM’s global Field system and dynamics, and therefore, these phenomena should be correlated. Further confirmation of the non-gravitational component can be found in evidence that correlates the LOD with physical phenomena on Earth. For one, there is a well-established correlation in variations of the Earth’s rotation and polar motion, such as the Chandler Wobble. Our present understanding of the wobble has many unresolved problems, the most important of which is that it should decay and eventually disappear, but it is somehow continually reinstated. This leaves open the question of what is responsible for maintaining the wobble, as well as what mechanism is responsible for LOD alterations. Variations in the Earth’s rotation and continental motion (plate tectonics) correspond in such a way that the elastic deformations in the Earth’s crust have the same motions (torque) as the annual and semi-annual shifts in the LOD. This observation can only be explained by a field system controlling both LOD and plate tectonics. As in the discussion on earthquakes (see sections of Tome Three and Tome Five), this represents an enigma for conventional theorists. A relatively good correlation exists between changes in the LOD and the westward drift of the geomagnetic field. Periodic components in LOD fluctuations are described as annual, semi-annual, lunar monthly, and fortnightly. Evidence also reveals a spring increase in the LOD, which is activated at the vernal equinox. Similar periods are noted in all geophysical phenomena. Other phenomena that uncovers the workings of FEM are polar wander, reversals and jerks. The solar and lunar linkages are again apparent in the data gathered on these phenomena. Both the polar jerks and reversals display evidence of a mid-latitude effect that can only be explained by FEM. All excursions and reversals of the geomagnetic field are anomalous in the sense that they cannot be explained by the dynamo theory. It is not known how or why they are initiated. For example, if the reversal occurs too rapidly, then according to the dynamo theory there would have to be unrealistically rapid motions in the core. Generally speaking, polar excursions and reversals seriously challenge the dynamo theory, and they alone call for a new model of the Earth. In 1969-70 there was a jerk in the geomagnetic field that is global and appears “simultaneously” at stations far apart. Expected of FEM, a geophysicist comments: “This suggests that this phenomenon is produced either by global or regional sources.” Furthermore, stations along mid-latitudes, particularly the Field latitudes (and associated longitudes), display similar periods, and the 22-year solar cycle in polar jerks. The source of the jerk has important implications for the origin of the Earth’s magnetic field and internal structure, and the observations lead to interpretations that depart from the presently accepted model of the Earth, but conform with what would be due to the Field-dynamical Earth Model. As with other observations there are indications of a solar linkage in jerks. The jerks, such as in 1913 and 1969, are correlated with the 11-year solar cycle. The Sun’s helical motion around the barycenter, or center of mass, reached a minimum in 1913, and the greatest solar interaction took place around the equinoxes. Universal time (LOD) variations are associated with the Earth’s tilt on its axis, displaying the largest variations around the equinoxes. In addition, shifts in the geomagnetic field peak first. Again, all of this indicates that the Earth is responsible for the solar transformations. Further support for this linkage is evident in theories that attribute the jerks to both internal and solar changes. One of the most active periods of solar activity have been taking place as the new millennium approaches. As might be predicted, a geomagnetic jerk, as noted in the records of the geomagnetic observatories in Europe, took place about 1991. Again, a correlation between polar jerks and solar activity is noted. Between 1947 and 1972 there is no evidence for short-period signals that originate in the Earth’s core. Jerks were first attributed to internal processes, but were later correlated with solar activity. The entire system can be noted in that geomagnetic activity, solar activity, changes in the LOD, and other geophysical phenomena, including climate are correlated.